Henry was then 50 years old. Sometime in September 2003, he started to have persistent coughs. Antibiotics did not help him. An X-ray, done in November 2003, showed presence of a 1.5 cm lump in his left lung. Henry went to Singapore and did a PET scan on 23 December 2003. The findings wereconsistent with a primary tumour of the left lower lobe without evidence of hilar or mediastinal nodal spread or distant metastatic spread. PET staging is T1NoMo. The next day, a FNAC biopsy was done and indicated Non-small cell carcinoma. Henry returned to Penang and underwent a surgery – a left upper lobectomy on 7 January 2004. Pathologic diagnosis confirmed a moderately differentiated adenocarcinoma of the bronchus with foci of squamoid differentiation. There was no evidence of nodal involvement, i.e. Stage 1 disease. No additional therapy was advised and Henry remained well until late September 2004, i.e. barely nine months after the operation. His blood test on 27 September 2004 showed elevated CEA, at 21.1. A PET scan done on 29 September 2004, showed evidence of recurrent disease. Moderately FDG avid small soft tissue density adjacent to surgical bed, with one FDG avid precarinal node. This was suspicious of local recurrence. There were 2 nodules measuring 1.1 x 1.9 x 1.7 cm and 1.1 x 1.5 x 1.7 cm. There was no evidence of distant involvement. Henry subsequently underwent chemotherapy. He received a combination of Carboplatin and Gemcintabine and achieved a complete remission, after three courses of treatment. Henry went back to his oncologist in Singapore for consolidative treatment – consisting of radiation with concurrent weekly combination of Taxol and Cisplatinum over the entire six weeks of radiation. This means he received a total of 30 radiation treatments and 6 cycles of chemotherapy. All treatments were completed by 26 January 2005. Henry appeared to be well except for a dry cough, which according to his doctor, was due to radiation pneumonitis. A repeat PET scan done on 21 Febraury 2005 showed no evidence of disease. Henry continued to go to Singapore for review every two months. From June 2005 to June 2006, Henry was prescribed Iressa. He took this oral drug as apreventive measure. From September 2007 to end of November 2008, Henry switched from Iressa to Tarceva, another related oral drug. This time, he also took Celebrex, 200 mg for pains. Henry took Tarceva also for the same reason – as a preventive. On 25 August 2007, a CT scan showed a new 1 cm nodule in the anterior segment of the right upper lobe, highly suspicious for metastatic recurrence. The means that the cancer had spread to Henry’s right lung. PET scan done on the same day, 25 August 2007, confirmed the development of a new nodule. A CT scan done on 11 October 2008 showed the nodule had grown to 1.9 x 1.4 cm. In view of the recurrence, the consumption of Tarceva was increased from 100 mg to 150 mg.
Another repeat PET scan was done three months later, on 1 December 2008. The nodule in the right upper lobe showed marked increase in FGD activity and is in keeping with active metastatic disease. The nodule increased in size to 2.0 x 1.7 cm. In view of the deterioration condition, Tarceva was abandoned and Henry was started on a new oral drug called Alimta. Each cycle of Alimta cost $10,000. Henry received 6 cycles, costing $60,000. A CT scan done on 23 January 2009, showed the right upper lobe nodule remained unchanged. On 8 April 2009, Henry underwent a radiofrequency ablation (RFA) – a procedure that cost RM 7,000. The lung nodule at this stage had already grown to 3 x 2.4 x 2.5 cm. The medical report said: Successful percutaneuos CT guided RFA is performed. A good ablation zone is achieved. A repeat CT scan after 6 weeks is scheduled. Henry came to see us on 24 April 2009 and expressed his dissatisfaction and desperation. He was started on Capsule A, Lung 1 & 2 teas and C-tea. This is indeed a classical story which most lung cancer patients need to read before undergoing any invasive procedures – may it be surgery, chemotherapy, radiotherapy or taking of the oral drugs – Iressa, Tarceva or Alimta. Don’t be caught unaware and don’t be ignorant. There are some questions which patients should ask. Is this case an exceptional or rare case of failure? No, it is not rare at all. This story is often repeated far too often. Therefore this is something that can be expected. Read the various case reports on lung cancer in this website and make you own conclusion. Can surgery cure lung cancer? In this case, the answer is NO. To start with Henry had a 1.5 cm nodule in his left lung. In January 2004 a part of his left lung was removed. Nine months later, the cancer recurred on the same side of his lung. This time there were two nodules. Surgery did not cure anything! But did it not make things worse? What could have happened if the original lump was just left untouched? Can surgery spread cancer? In August 2007, barely three and a half years after the so calledsuccessful surgery, a new lump was detected on his right lung, meaning the cancer had spread from the left to the right lung. Was it because of the surgery that made the cancer moved to the right lung? The study of cancer biology tells us that surgery could spread cancer or can make dormant tumours grow and proliferate. Can chemotherapy cure lung cancer? In this case, obviously it cannot. It can give rise to false hope. 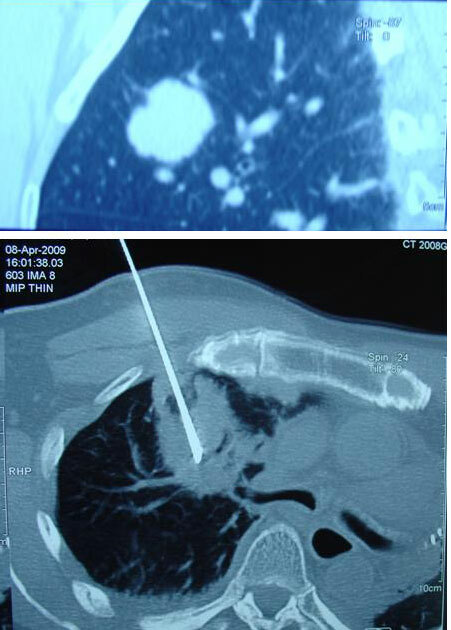 After 3 cycles of Carboplatin and Gemcitabine, the original 1.5 cm nodule in the left lung disappeared. The doctor felt good and patient celebrated the success. But it is all a hoax, if I may use this word. I have seen such false hope happening all too often. Does the shrinking of tumour means a cure? Never and don’t be misled. Make no mistake, chemotherapy or oral drugs can or may shrink tumours. But shrinkage is not a cure. Soon the tumour will grow back – sometimes becoming bigger than the original size. Stephane Bonoist et al (J Clin.Oncology 24: 3939, August 2006: Complete response of colorectal liver metastases after chemotherapy: does it mean cure?) reported that 66 liver metastases disappeared after chemotherapy as seen in the CT scan. However, after 1 year of follow-up, 55 or 83% of these 66 liver metastases proved to be residual disease or recurrence. The authors concluded that in most patients receiving chemotherapy for colorectal liver metastases, a complete response on CT scan does not mean cure. What is said about liver metastases may apply equally well to lung cancer tumours. I have seen enough cases to come to this conclusion. This is what Dr. Ralph Moss said about tumour shrinkage: This is a great lie about chemotherapy. Shrinkage of tumour is meaningless. Is consolidation therapy after an apparent “successful” result beneficial or meaningful?Henry received more chemotherapy and radiation treatments to consolidate what had been achieved. Theoretically, the procedure makes sense but in practice it is a disaster. Patient spent more money for the extra doses of chemo and radiation but this very same treatment might have prepared the ground for future recurrence. To the holistic practitioners, adding poisons strips the body off its immune system – how then can one expect the body cures itself? Is Iressa effective for lung cancer? It is well documented that Iressa caused more harm than good. In the Western countries Iressa was withdrawn because it was just a dangerous placebo! In Asian countries it is said that Iressa can make patients live longer by 4 months. Take note, no where in the literature is it written that Iressa cures lung cancer – it merely prolongs life by 4 months. Is Tarceva effective for lung cancer? Patients taking Tarveca prolong survival by 2.8 months. It costs about RM 8,000 per month to be on this drug that has not shown to cure anything. What about Alimta – a $10,000 per month drug? According to the website the median survival time was 8.3 months in the Alimta treatment arm and 7.9 months in the docetaxel arm. The study did NOT show an overall survival superiority of Alimta. In simple language, Alimata is NO better than docetaxel (and this was what Henry received for 6 weeks in December 2004). Sure enough Henry did not benefit from Alimta. After all said and done, Henry had already spent about RM 300,000 for the above treatments. What did he get in return? Nothing, no cure. An initial lump of 1.5 cm had turned to become a metastatic lump of 3 x 2.4 x 2.5 cm in size, growing in the other side of his lung. This is more than what Henry has ever bargained for with his RM 300,000. Needless to say, Henry was greatly disappointed. And disappointed patients are driven to herbalists and other alternative practitioners. What choice have these patients got now? Most of them, after an adventure like this, have almost exhausted their life time savings as well. Let others who come after Henry learn from his experience.